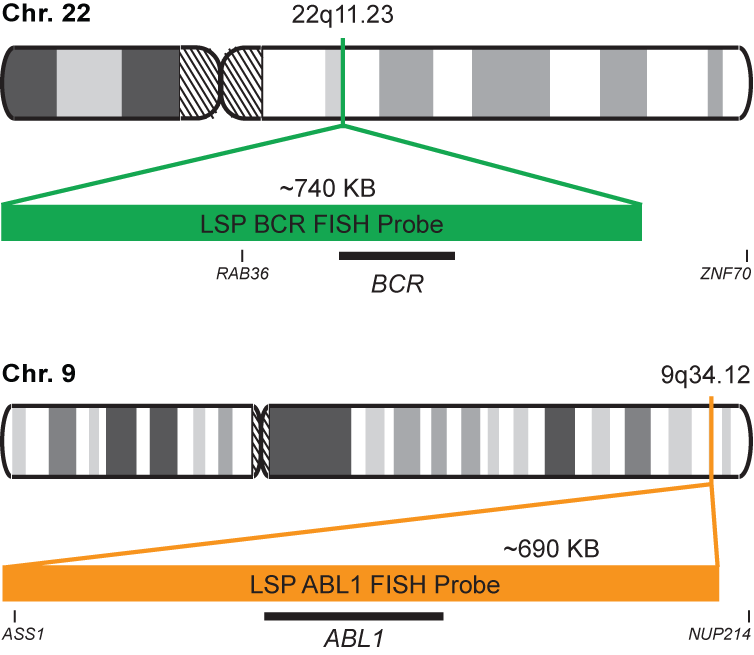 The BCR-ABL1 FISH probe pair is designed to detect rearrangements involving regions of the human BCR (Breakpoint cluster region) locus, located on chromosome band 22q11.23, and of the human ABL1 gene on 9q34.12. One probe covers the entire BCRgene along with some upstream (5’) and downstream (3’) flanking untranslated genomic sequences. The probe overlaps the known major and minor breakpoints observed in the region. The second probe spans the complete ABL1 gene on 9q34.12, including the common breakpoint region upstream of exon 2, as well as adjacent 5’ and 3’ untranslated genomic sequences. The probe set is optimized to reveal the typical t(9;22)(q34;q11) translocation as well as other translocations between the two genes, in metaphase and interphase blood or bone marrow cells.